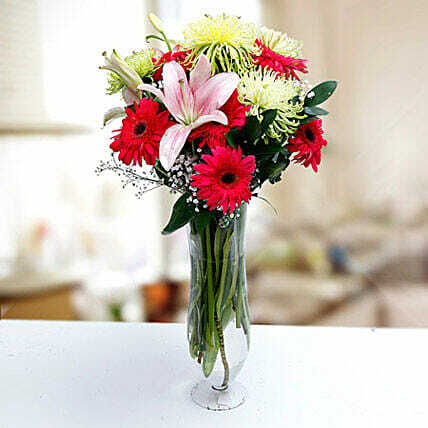 Elegant and stylish, this fresh bouquet arrangement comprising dark Pink Asiatic Lilies and Green Deli Stars resonances with your special sentiments about your loved ones. Celebrate the day even in the most beautiful manner by sending them a Pink themed bouquet. This flower arrangement is an extraordinary way of expressing your strongest sentiments to your loved ones. Abounding with bold personality, this colourful mix of flowers is sure to extend warm wishes and affection to delight your recipient.